The basic principle of the learning circle is that there are three learning zones and as we develop new skills things move from one zone to another. Things we already know how to do and don’t need to think about (simple addition, for instance) are located in the “comfort zone.” In the “learning zone” we’ll find the things we don’t yet know that stretch our capabilities but are possible with hard work and practice. 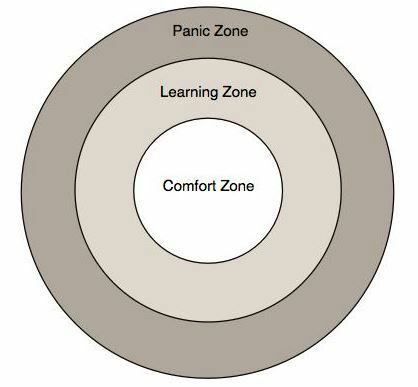 The outer circle, the “panic zone,” is the area in which things move our capabilities past stretching and into panic. They’re the things that are not (yet) possible for us to learn. For the second grader, calculus is firmly in the “panic” zone but can move into the “learning zone” after just a few years of education. You could also apply this to exercise. Taking a walk might be in the comfort zone and going for a jog might enter the learning zone but running the Boston Marathon is situated firmly inside the “panic” zone. It’s just not possible. Yet. Because the great thing about the learning circle is that the things we do can cross categories. The student learning multiplication eventually “gets it” and multiplication enters the comfort zone as they begin working on something new located in the learning zone, which before would have been firmly within the panic zone. The trick is taking the steps necessary (and figuring out what those are) to move things from one zone into another. 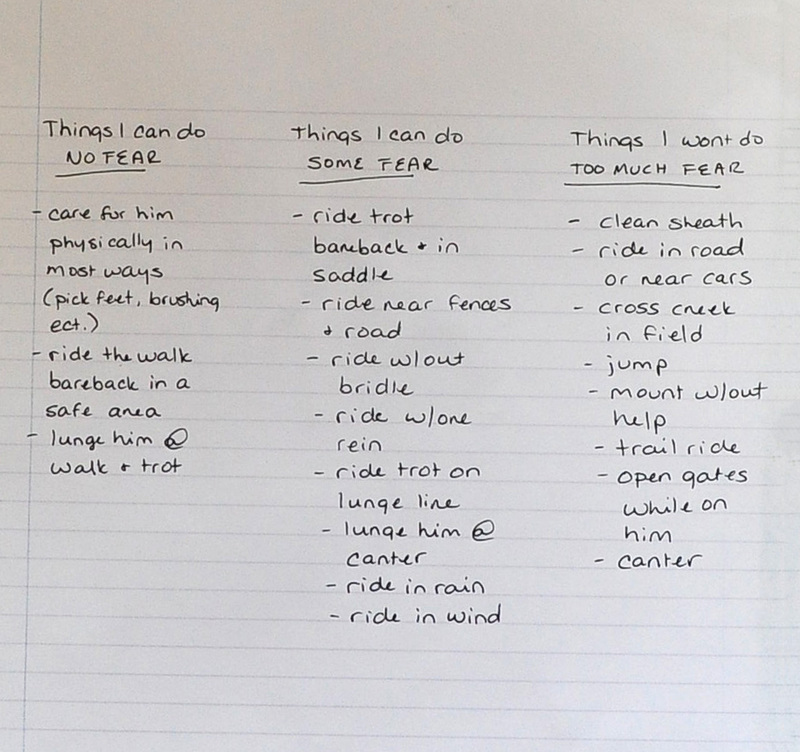 Right away, I saw that there were things I could easily move from the “some fear” to “no fear” column with practice, like trotting and riding without a bridle. Maybe I can’t yet trot Asterion all over the field, but I can certainly trot him for a few seconds today and a few more tomorrow, each time moving to that point when fear screams “STOP!,”, and then staying with it for just a FEW more seconds. The next day, the point of fear ought to move just a bit further away (ie. today perhaps I can only trot for five seconds before panic sets in, but if I push past that point by just a few seconds then tomorrow I’ll be able to trot for EIGHT seconds before panic sets in, and on and on.) In that way, as I “move closer” to my goal, and “stay there longer,” the point of fear stretches until it simply no longer exists. Move closer to the thing I’m afraid of, and stay there longer. This entry was posted in Anxiety, Fear, PERSONAL. Bookmark the permalink.